Oscilloscopes are ideal for troubleshooting a circuit. These instruments will give you more information than a multimeter. 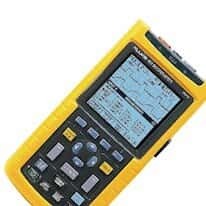 We offer oscilloscopes in basic models packed with tools to help you learn and master the use of the oscilloscopes or oscilloscopes complete with a built-in spectrum analyzer. You can also contact us to configure your oscilloscope with the many software and analysis module options we offer.